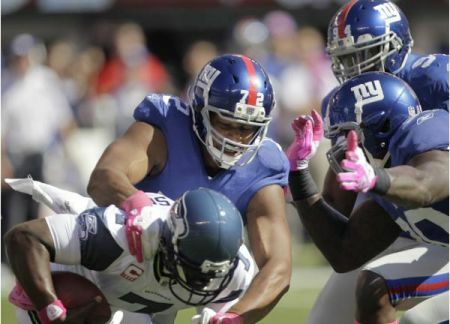 The New York Giants committed five turnovers and Seattle scored 14 unanswered points to close the game as the Seahawks won 36-25. Eli Manning threw for 420 yards, but also committed four of the Giants (3-2) turnovers, including an interception to Brandon Browner with only 1:08 remaining in the game. Browner returned the interception 94 yards for a touchdown. Seahawks (2-3) quarterback Tavaris Jackson started the game and threw for 166 yards with one touchdown and one interception, however, he left in the third quarter with a right shoulder injury. Seattle scored on their opening possession when Jackson found Ben Obomanu on a swing pass for an 11-yard touchdown. New York quickly responded on the next drive when Manning threw a touchdown pass to Jake Ballard for the second-consecutive game. Marshawn Lynch propelled the Seahawks for the team’s second touchdown when he ran for a 47-yard run late in the first quarter to the Giants one-yard line. Lynch would score on the next play to put Seattle up 14-7. Both defenses began to settle down in a mostly scoreless second quarter until Jackson threw a costly interception to Aaron Ross which set up Manning’s second touchdown, a one-handed, 19-yard snare by Hakeem Nicks to tie the game at halftime. Seattle regained the lead in the third quarter when Anthony Hargrove tackled D.J. Ware in the endzone for a safety. The Giants would get their first lead of the game in the fourth quarter when Manning connected with Victor Cruz for a 68-yard touchdown. Ahmad Bradshaw successfully converted the two-point conversion to give the Giants a 22-19 edge. Charlie Whitehurst, however, stepped up in the absence of the injured Jackson and instrumented a fourth quarter comeback with less than five minutes in the game when he capped off a seven play, 80-yard drive with a 27-yard touchdown pass to Doug Baldwin to give Seattle the lead again 29-25. Whitehurst finished the game with 149 passing yards. With the Giants in the red zone, Manning threw a pass to Cruz, which was tipped off his hands and hauled in by Browner, who returned it 94 yards for the touchdown that finished the Giants. The Giants how the Buffalo Bills (4-1) next week as Seattle (2-2) enters a bye week.